An India PSLV launch vehicle put a military satellite and 28 commercial small satellites into orbit last night, March 31, at 11:57 PM EDT. Commercial customers included Astrocast, a pair of NanoAvionics-built satellites, four Spire Lemur-2s, and twenty Planet Dove imaging satellites. All satellites successfully reached orbit, with the PSLV demonstrating the capability to deliver spacecraft into three separate orbits. Primary payload for the launch was EMISAT, an electronics intelligence satellite weighing in at 436 kilograms. 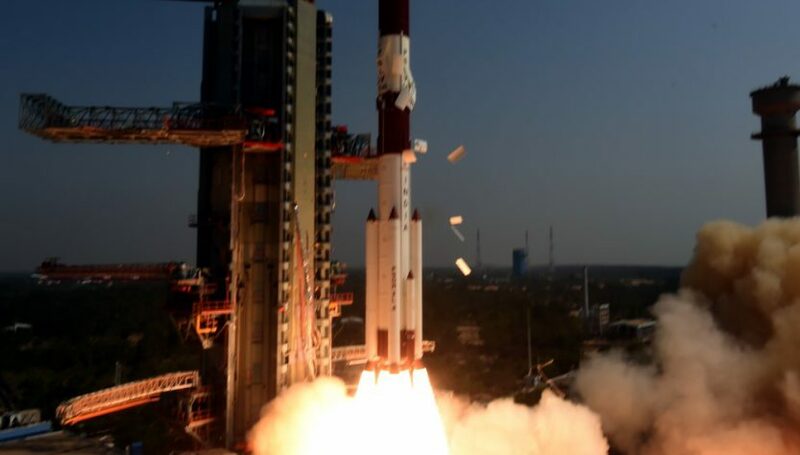 The small satellite is designed to sense radar and radio transmissions, with Indian officials being very guarded as to the capabilities of the spacecraft and how it complements the nation’s existing abilities. Astrocast now has two test satellites in orbit, the first launched in December last year onboard the SpaceX SSO-A mission. The newest 3U-size satellite includes a number of technologies to ensure the safe in-orbit operation of the satellite for separation, collision avoidance and de-orbiting. New technologies onboard the satellite include gas propulsion, electric propulsion, automatic de-orbiting, and backup communications. The satellite also includes the company’s Internet of Things (IoT) communications capabilities, enabling customers to test Astrocast services. Astrocast’s operational network will be a constellation of 64 cubesats specifically designed to transmit and receive low bandwidth data from IoT devices. NanoAvionics now has two M6P satellites in orbit and three customers onboard. BlueWalker 1 is a dedicated satellite for parent/owner AST&Science to test AST technologies in orbit, possible for defense applications given the level of disclosure around the payload(s) onboard. IoT (Internet of Things) startups Blink Astro and Lacuna Space are sharing the second satellite, with Blink testing its package while Lacuna is going to receive terrestrial LoRaWAN signals and relay the data through its cloud-based network to beta customers. Spire Global adds four Lemur-2 satellites to its constellation and has launched a total of 100 satellites into orbit to date. The company has over 70 active cubesats in orbit today and plans to build up a total of 150 spacecraft for a constellation providing AIS ship tracking, ADS-B aircraft tracking and GPS-RO radio frequency weather data. The biggest batch of cubesats put into orbit yesterday were 20 Planet Dove imaging satellites. The Flock 4a models add up to between 150 and 170 Dove satellites into orbit collecting imagery at 3 to 5 meters per inch. Planet collects over 6 TB of data per day, imaging the entire surface of the Earth.